To answer that question, these beginner hiking tips are laser focused on getting you started hiking as fast as possible. You're here for how to hike advice, and I'm going to deliver. This page outlines exactly what you need to get started hiking, based on hundreds of reader's questions and my 45+ years of trail experience. 1. Treat your feet right: happy feet = happy trails. 2. Bring enough food and water to fuel your hike. 3. Start where you are in terms of physical conditioning, and build from there. 4. Carry ten lightweight hiking essentials for safety and comfort. 5. Use established, well marked trails and carry a map every time. 6. Know the forecasted weather and plan accordingly. 7. Wear clothing in layers so you can adjust to fluctuating weather. 8. Leave an itinerary of your plans at home with someone you trust. 9. And leave no trace of your visit to the outdoors. 10. Be gentle with yourself by adjusting your pace and destination as needed. Hiking For Her offers you the detailed beginner hiking tips you need in each of these 10 categories. But use this handy infographic to remind yourself of the essentials of starting your hiking career. Now it's time for some detailed beginner hiking tips! To get started hiking, you need things in both the physical and mental realms. Did you feel surprised about the "mental" part of beginner hiking tips? Hold that thought! a destination, with a plan to get there and back. You can search for any of these words. Just use the green box at the top of this page! The blue word TOP over there on the right will take you there fast. 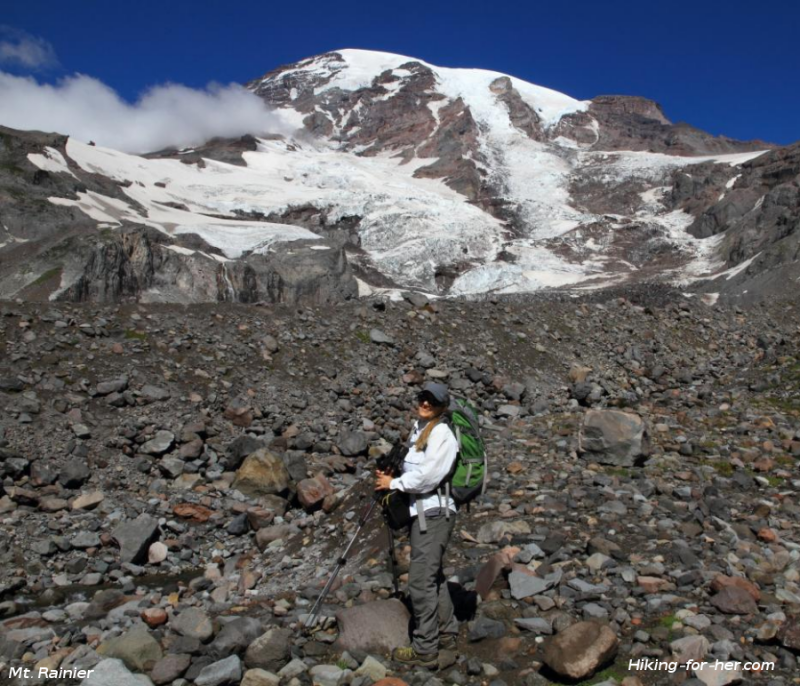 It's a good idea to take a close look at what an experienced hiker considers basic hiking gear before you go shopping. Beginner hiking tips - let's get started up the hill. Always use reliable hiking gear sources as you begin to fill up your gear locker and hiking clothes closet. To avoid overwhelm, look over this beginner gear guide I put together just for you, using REI as the source of high quality, durable and trustworthy hiking gear and outdoor clothing. 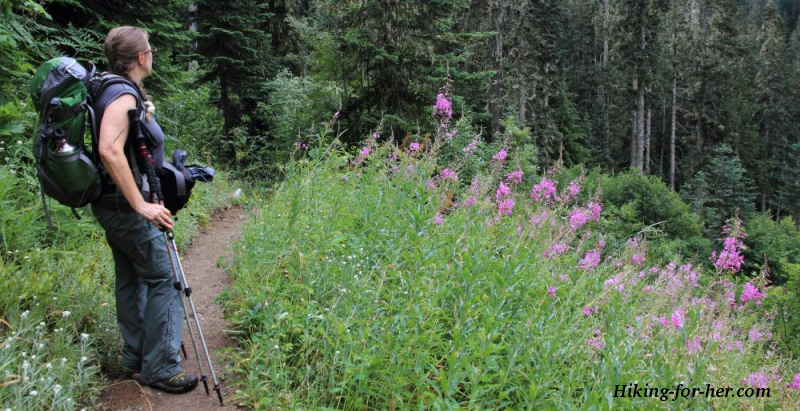 And you can quickly find some of the best tips for beginner day hikers right here. If your feet are sore, cramped, blistered or too hot, you're not going to hike. Or your hiking time will be pure misery, which means you'll give up your hiking goals. Before you do anything else to join the hiking community, get the best hiking boots or most comfortable trail shoes you can afford. The guide is loaded with beginner hiking tips for your feet. For specific tips on how to choose the best hiking boots for your particular arch and foot shape, read this Ultimate Guide to choosing trail footwear. Now let's take a close look at what I recommend for beginner hiker foot comfort in moderate price ranges. The brands I recommend are the ones I use myself, year after year, mile (or kilometer) after mile. Start off on the low end of the hiking boot price range if you are going to stick to well established, mostly flat trails. In fact, trail shoes might be your best bet. Read my recommendations for the best beginner hiking boots and shoes. I think of hiking boots/shoes and hiking socks as one unit. Both have to perform well in order for my feet to stay dry, cool and free of blisters. Darn Tough socks. I use medium weight crew style socks, like these. If you want lighter weight socks, I'd recommend these SmartWool hiking socks. Liner socks are used under these hiking socks to wick moisture away from your skin, thus preventing blisters. I use Fox River X-Static sock liners as well as liners like these. On your first few hikes, you won't be carrying much weight. You won't be going very far. You don't need fancy stuff like an ice axe loop or a hydration system on your day pack - unless you want them. So start basic with Backpacks 101, but not TOO basic. Be careful to buy a pack that will serve you well on the trail a year from now, not just tomorrow. I have two brands which I absolutely recommend for a beginning hiker. Here are a few words about why each brand is so trustworthy. Deuter daypacks are incredibly sturdy and engineered for comfort. This backpack is low volume (22 liters), just large enough to carry your essentials. I've been wearing Deuter packs for more than a decade, and have never been disappointed. This is what I currently use on short day hikes: Deuter 22 liter pack. Osprey is another brand of hiking day packs I use frequently. This is the pack I use on moderate day hikes, and also as carry on luggage when I travel by plane to hiking destinations. It has clever design features and fits well without being too bulky. 24 liters is just right for a day hike. If you're on a budget, share this Best Hiking Gift Guide with your loved ones when they ask you what you need to get started. Once out on the trail, you're responsible for your own safety and comfort. Your pack will carry your food and water, but it should also be loaded up with these ten essentials. Essentially (!!) they keep you safe & buy some time if something should delay your return to the trail head. And they help you Leave No Trace, another important hiking principle. Don't wear cotton for anything except the driest, hottest hike. You need clothing that wicks your sweat away from your body and doesn't stink while doing it. Cotton absorbs water nicely, but then takes its sweet time releasing it, leaving you clammy and potentially hypothermic in cool weather conditions. You also need hiking clothing that moves with your body as you bend, twist, and step over rocks. Here's the absolute minimum hiking clothing that will work for you on the trail, based on what I wear and know that it works. This is the layer up against your skin, so make some careful selections to guarantee your comfort. Hiking sports bras are designed to prevent chafing and bouncing while wicking away sweat. I turn to Moving Comfort again and again, specifically this bra. Plus size sports bras for hikers can be difficult to find. Read this for some hints. Wicking underwear is also essential for your lower half. I turn to ExOfficio when I want durable and wicking briefs. But your current cotton or nylon underwear might be just fine when you're starting out in warm, dry weather. Experiment! You'll get overheated if you wear too many layers on a nice day. Here's the style of shirt that I wear for day hikes, in two versions: short sleeves and long sleeves. Hiking pants need enough room for your knees and hips to move freely. Avoid really tight fitting clothing because it compromises your circulation and literally cuts into your muscle power. You can get away with lightweight pants like these when you're just starting out. If you're searching for plus size hiking pants, these tips will help. Or pick a great pair of hiking shorts! You probably don't need one, but extra clothing is one of the famed Ten Essentials. Bring along whatever jacket you already own. Or read about the best hiking jackets here. You might be shocked at how hungry you get during a hike. And the huge appetite might linger into the next day. That's what it feels like to be an endurance athlete a.k.a. a hiker. So begin to think of food and water as fuel. Bring high quality nutrition along on every hike, and train your body to hike on lots of carbohydrates and water. Calories from carbohydrates give you quick energy. Staying hydrated allows these calories to be delivered quickly to your muscle cells (among others). If you're really into the idea of trail nutrition, start here. So this page focuses on the basic hiking gear and clothing you'll need to start down the trail of your choice. You'll have to build your own mental game plan, and record it in your trail journal (a great habit to develop as your skills develop). Hiking infographics are a great way to summarize essential hiking tips, so here is one more for you! Need some encouragement and advice as you're starting out? Or as you work to attain that next level as a hiker? This supportive, private virtual community welcomes hikers of all ability levels. That means a beginner hiker is in exactly the right place to find support, answers, and maybe some hiking buddies! Details about joining this virtual hiking community are here. Group hiking trips run the gamut from an overnight to a beautiful destination, to a week or more backpacking through the backcountry. You can leave all the logistics and planning to experienced guides, and concentrate on your gear. Read these tips on when, and why, a group hiking trip might be useful to you. Now you know how to get started with the basic hiking gear and athletic clothing that you need for hiking. You also have a heads up that eating for the hiking trail is a bit different than your usual diet. 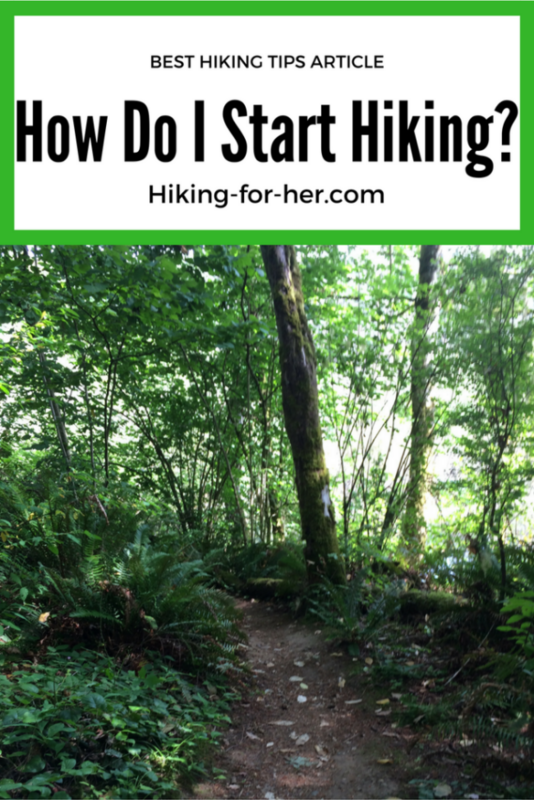 Use this link to the Hiking For Her site map to explore the reasons why I make these recommendations as solid beginner hiking tips. And don't forget, you can email me directly. And please don't be shy. Send your hiking question and expect a personal answer! You can dip into the Hiking Question archive first here. Maybe your question has already been answered. Or use the search box at the top of every page to find detailed articles on the topics that interest you the most. Or this HFH Best Hiking Tips For Dayhikers book might be the best place to start. 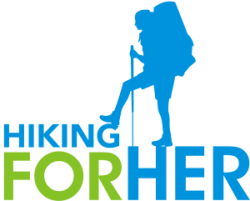 You can enter for a chance to win all sorts of hiking and camping gear, athhletic clothing, books, and fun outdoor products on this Hiking For Her current giveaways page. Bookmark it, and check back often so you never miss a chance to be a winner on the trail of life. You can also join our free weekly update list to receive the latest hiking news and be notified of flash giveaways. Use the gray "why wait a whole month?" box below! Just so you know, some of the links on this page and elsewhere on the website are affiliate links, which is the way all of this hiking information can stay available to you free of charge. If you purchase hiking gear through one of the links, you pay nothing extra but Hiking For Her is rewarded with a very small percentage of your purchase price. It keeps this website humming along. I only recommend, and link to, the stuff I know, trust and use myself. You can see it being used in the photos on this site. These beginner hiking tips are only the tip of the iceberg, so please look around and use all of the resources that are provided for you. Thanks for your support of this website, it is deeply appreciated.